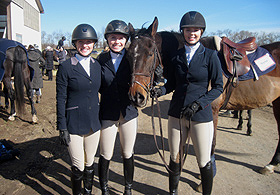 From left to right are Olivia Durkin, Emma Bergqvist, "Martel" and Ashley McNally as seen at Briarwood Farm at Black River Farm in Ringoes, New Jersey on March 24th. While Martel belongs to the farm the other three are all Penn State University seniors. While Durkin was third in both intermediate flat and novice fences that day both Bergqvist (in intermediate fences) and McNally (in intermediate flat) were second. Seeing this was Zone 3, Region 1 Regionals this meant both Bergqvist and McNally moved forward to Zone 3 Zones which was one of seven IHSA Zones shows to take place over the April 6th/7th weekend. And 'stop the virtual presses' Bergqvist and McNally reached Nationals individually in these divisions on April 7th. The field for the 2019 IHSA Nationals Hunter Seat Team Competition has been set. The following 16 teams are in thanks to the results of Zones shows held March 30, April 6 and April 7: Roger Williams University, Sacred Heart University; defending National Champion Skidmore College; Cornell University; Delaware Valley University; Penn State University (State College); Emory and Henry College; Sweet Briar College; Savannah College of Art and Design; Louisiana State University; Miami University of Ohio; Otterbein University; Purdue University; West Texas A and M University; Stanford University and the University of Southern California. Roger Williams and Sacred Heart (both from Zone 1) will be making their first IHSA Nationals appearances with a full hunter seat team while Cornell, Delaware Valley, Emory and Henry, Sweet Briar, Louisiana State, Miami of Ohio and Southern Cal will be back after having not qualified for 2018 Nationals. Several high profile programs saw their long streaks of consecutive Nationals appearances snapped. We hope to post the results slightly later than hoped for most of the Zones shows on Monday evening (the results from Zones shows in Zone 1 and Zone 5 are already posted). 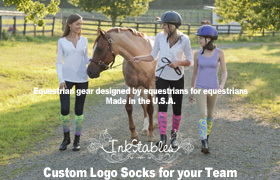 Campus Equestrian's Facebook Updates let everyone know when specific areas of the site have been updated. Become a Facebook Fan of campusequestrian.com and you will be informed when we have posted new results, new stories or modified information of some kind.